From the pen of screenwriter Robert Towne and the vision of director Roman Polanski comes a modern film noir that brings back to life the glory days of dark, complex and slow-boiling detective stories filled with seedy and shady characters, all of whom are more dangerous and desperate than smart. Los Angeles, 1937. Private investigator Jake Gittes (Jack Nicholson), who formerly worked for the police department in Chinatown, is hired to confirm the infidelity of Hollis Mulwray, the Chief Engineer with the city's water company. Los Angeles is in the middle of a drought; there is a pressure to build a new dam; Mulwray is uncovering a midnight plot to inexplicably dump large amounts of water from the city's reservoir; Jake snaps photos of Mulwray with a young woman; and soon Mulwray is very dead. As Jake noses around one of the city's water reservoirs to untangle the web of Mulwray's murder, his nose is sliced open by a knife-wielding thug hired to scare him off. In next to no time Jake finds himself unwittingly drawn into a large complex conspiracy involving a simulated water crisis being played out for a few powerful individuals to gain control over huge amounts of real-estate and shape the future of the city. Evelyn Mulwray (Faye Dunaway), the widow of Hollis, is caught in the middle between her late husband's legacy and her powerful father's pure evil, and turns to Jake for help. As another murder is committed, the police, including Jake's former partner in Chinatown, start to crawl all over Jake, and he slowly becomes aware that Evelyn is hiding a devastating secret that threatens to destroy her and anyone standing too close. For Chinatown, Polanski re-creates a depressed Los Angeles as a small town filled with the thin veneer of respectability, but with a rotten core almost punching through to the surface. Jack Nicholson portrays Jake Gittes as a smart mouth happy to make a good living cruising through the underbelly of LA, who nevertheless soon realizes that he is facing events much bigger than he can handle. 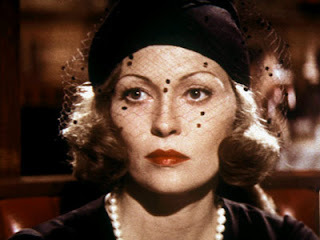 Faye Dunaway oozes, in turn, power, mystery, danger, seductiveness, and ultimately sheer vulnerability as she loses her husband and finds her life hurtling towards sudden destruction. And in a majestic nod to the golden era of film noir, John Huston makes an appearance as Noah Cross, the mastermind behind the plot to regain the power he once held over the entire City. In 1942, Huston wrote the screenplay and directed The Maltese Falcon, one of the foundation stones of the noir style. 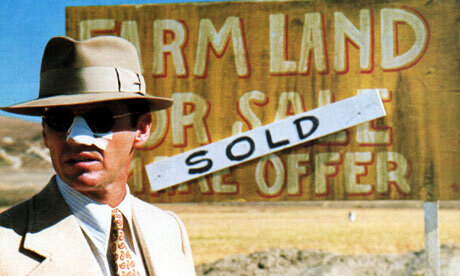 Towne's Chinatown script allows the film to gather the dust of depression and doom as the story unfolds. Every time Jake learns more about Hollis, Evelyn, or Noah, he realizes how little he knows about what is going on, and how much bigger the conspiracy unfolding around him really is. With Jake trying but unable to control the overwhelming forces conspiring around him and Evelyn, the film slowly but surely edges towards a grim ending, inevitably in Jake's old Chinatown turf. In the aftermath, with no part of Jake's plan having worked out, Towne nails down in movie history the film's defeatist final line: "Forget it Jake, it's Chinatown." Jake will not forget the events of that night, just as Chinatown is a brilliantly unforgettable experience.